The offices of Country Music Television are located in Nashville, TN. This urinal features the CMT Outlaws Wizmark, an advertising device placed into urinals that is capable of playing an audio message when the urinal is used. This Wizmark has been launched in October 2004 to promote CMT's upcoming Outlaws concert. 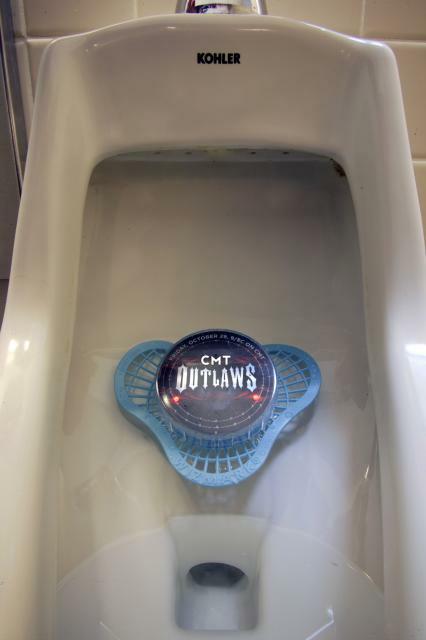 FIRST-EVER INTERACTIVE URINAL COMMUNICATOR TARGETS MEN: "DON'T MISS 'OUTLAWS' ON CMT"
NASHVILLE - October 6, 2004 - "Target marketing" has taken on a whole new meaning in the first-ever viral marketing use of an "interactive urinal communicator" in America. To help create buzz for its new landmark television event, CMT OUTLAWS concert and countdown specials premiering Friday, Oct. 29, CMT will target men at bathroom urinals in bars, concert venues, colleges and radio stations with the - Wizmark� - the world's first and only device of its kind. The deodorizing urinal drain filter cover - featuring a waterproof anti-glare lenticular viewing display, pre-recorded audio and flashing lights - is motion-activated: step up to the urinal and the unit starts flashing, talking and alternating pictures. The units are designed to last more than 10,000 flushes. "We're always looking for innovative ways of reaching viewers, in this case the male audience," says James Hitchcock, Vice President, Creative and Marketing, CMT. "The new interactive urinal communicator from Wizmark enables CMT to target a very captive and vulnerable audience with our humorous pre-recorded message - recorded by a woman - that commands, 'Don't miss OUTLAWS on CMT. You seem to miss everything else!'" "The social protocols of the use of a urinal - the unwritten rule not to look left or right - guarantees undivided and undistracted visual attention along with the concurrent audio delivery of the 'Don't miss OUTLAWS on CMT' tune-in message," says Hitchcock. "This new marketing tool is unexpected, unapologetic and good humored." CMT's new original specials being promoted by the Wizmark focus on country greats who make their music and live their lives according to their own rules. CMT GREATEST OUTLAWS: THE DIRTY DOZEN, a countdown of country's original rule breakers, premieres Friday, Oct. 29 at 8:00-9:00 PM, ET/PT.